REGISTRATION AND SPONSORSHIPS ARE AT CAPACITY FOR 2018. SubAla's Industry Awards Banquet honors members of the state's construction community for their contribution towards excellence in our industry. 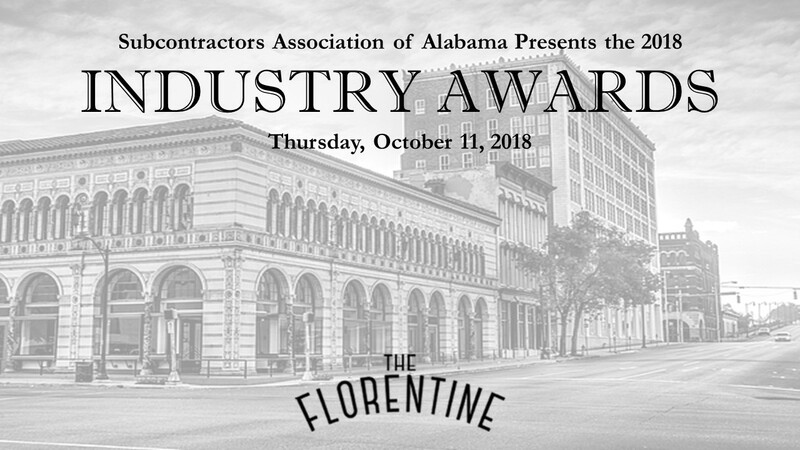 This industry-wide event includes all facets of the construction sector, including architects, engineers, general contractors, subcontractors, suppliers and vendors, who are interested in recognizing excellence in construction. Additionally, special recognition will be given to a State Legislator for their support of our industry. Join us October 11th at The Florentine Building to recoginize the men and women who have positively impacted our community. Congratulations to our 2018 Industry Award recipients! We are honored to celebrate your achievements on October 11th! General Contractor of the Year (75-199 million annually)- Rabren General Contractors, Inc.
General Contractor of the Year (74 million below annually)- Rives Construction Company, Inc. Outstanding Woman of Construction- Kathi Walker, Paradiso Painting Company, Inc.
Subcontractor of the Year- CS Beatty Construction, Inc. Superintendent of the Year (199 million below annually)- Tom Brown, Blalock Building Company, Inc. Lifetime Achievement Award- W.E. Chip Braswell, Quality Architectural Metal & Roofing, Inc.